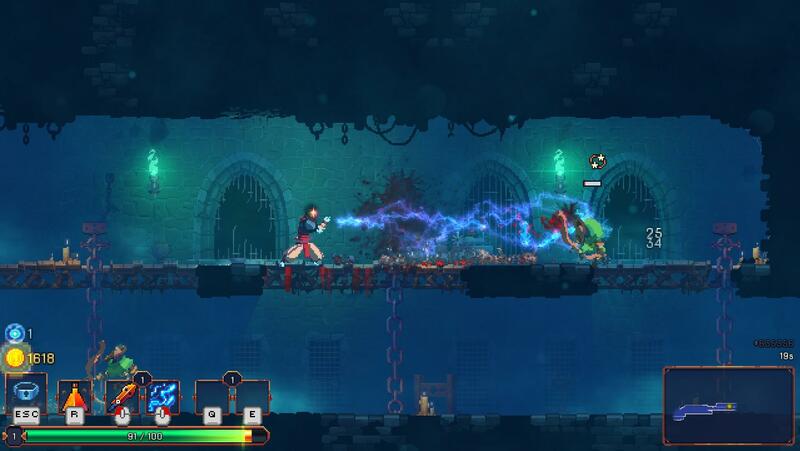 The punishing gameplay of Souls-like games is meeting the navigation of Metroidvania in a rogue-lite that’s difficult, frustrating and rewarding at the same time. Prepare to navigate using a sidescrolling camera through a shapeshifting procedurally generated world that holds powerful enemies, unique items and secrets. 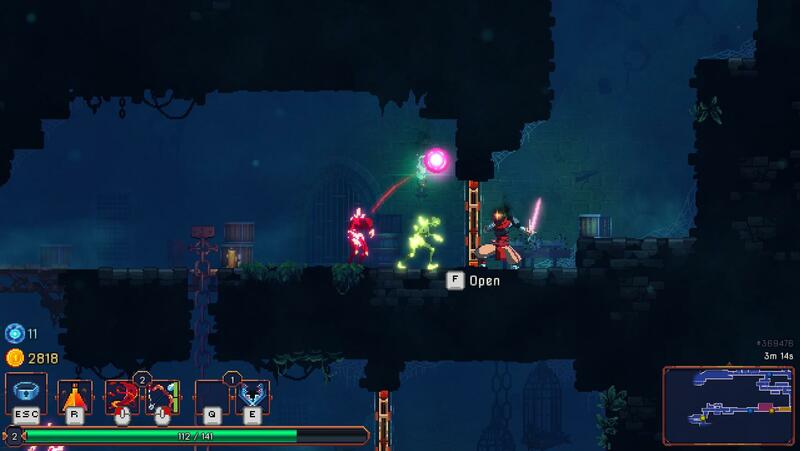 Dead Cells is following the trend set by the Souls games providing players with multiple options of style defining weapons which have limited but different movesets and randomized stats. While you don’t have control over the weapons you’ll gain, make sure you’re comfortable with the weapons you’re equipping because they can be tricky to use. The dodge mechanic is a powerful and versatile tool which can be used in defensive and offensive situations, but has to be understood first. Dead Cell’s dodge is not using invincibility frames but instead it provides avoidance for the whole animation’s duration. On use, dodge cancels the current action working a safety net when overextending with the attacks. 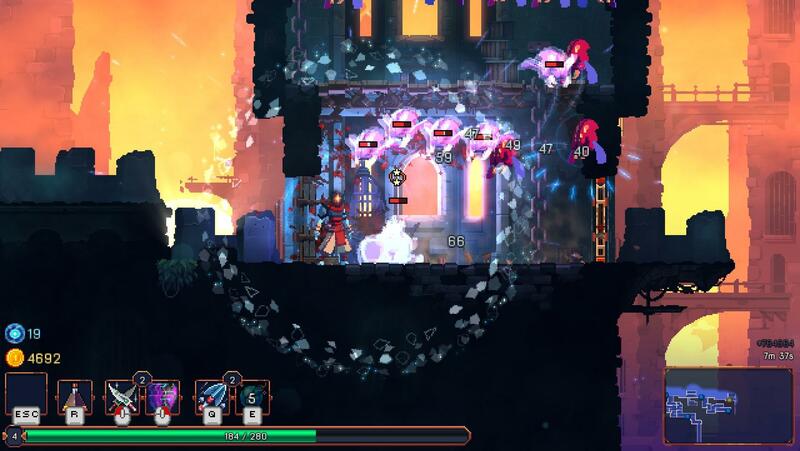 Lastly, as Dead Cells has a lot of platforming involved, the dodge has been adjusted to be useful in such situations and can be performed mid air or during climbing for the same protective effects. Use dodge with confidence, it’s a key mechanic in beating this game’s ever-shifting challenges. While every attack is avoidable, it’s hard not to take damage in a game of this nature. Healing plays a crucial role in advancing as further as possible and in my experience with the game so far, damage can be healed in three ways. The first is the conventional potion which starts with 1 charge that can be replenished in designated safe zones usually placed between each level filled with enemies. Potions can be upgraded for additional charges. The second way of healing requires a little bit of luck in the form or carrots dropped by mobs or secret areas. The third way of healing works in a similar fashion to a mechanic present in Bloodborne. Freshly received damage can be healed back up by dealing damage within a short time frame. A good yet rushy way designed to avoid wasting resources on every little mistake. Death is not the end, at least not in Dead Cells. The player’s character respawns back to the beginning of the game in a newly generated world losing the stats and weapons gained up to that point. But do not despair; your character doesn’t come back empty handed. 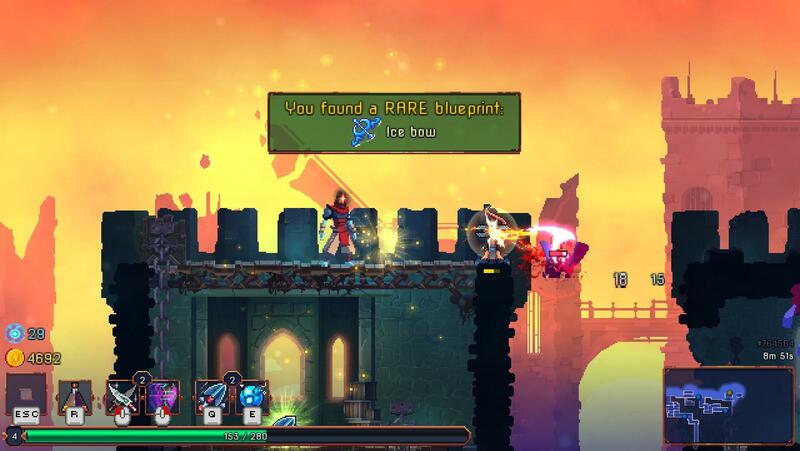 While progressing through the levels, enemies can drop blueprints and dead cells which can be used at a specific NPC to unlock new items which can be continuously upgraded with the dead cells. These upgrades are persistent and play an important role in beating the game. 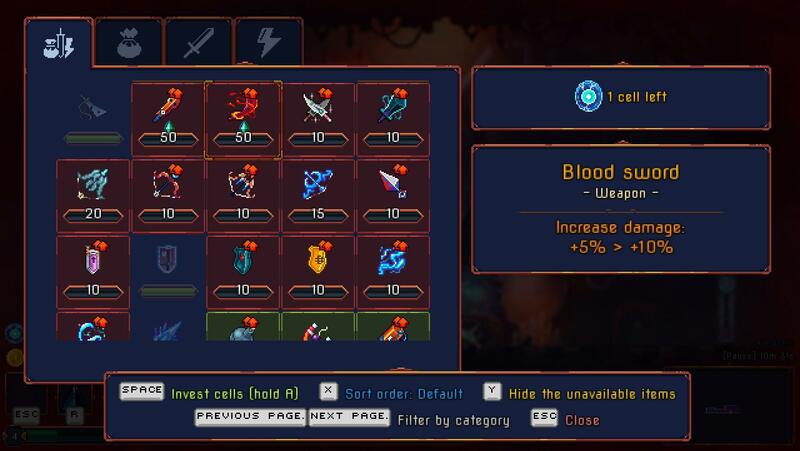 While there are plenty of options to progress your character including multiple weapons and skills, gaining cells isn’t a trivial task as they are lost on death. Make your way to the designated NPC and spend your cells wisely to increase your potion’s charges, retain gold after death and unlock random starting weapons based on your currently unlocked blueprints. 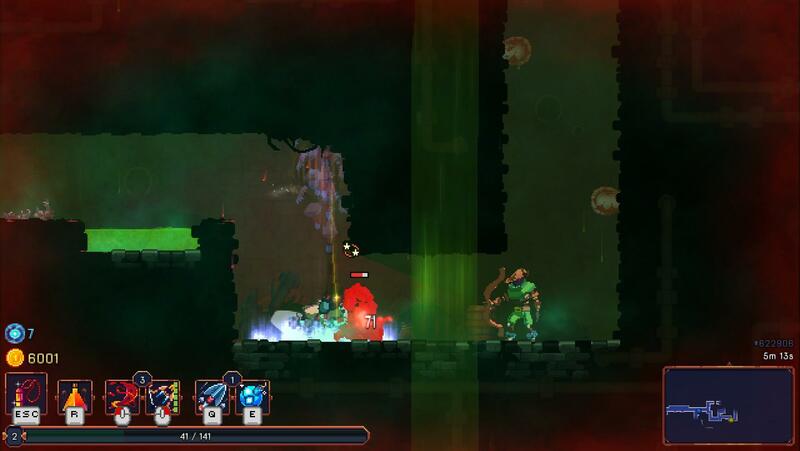 There isn’t a rogue-lite game without secrets and Dead Cells does not deviate from this rule. Wall blocks with a blinking rune marking on them can hide precious loot like gold or carrots and sometimes even portals opening up timed challenges for skilled players. Pay attention to the walls so you won’t miss useful loot that could help you progress even further. 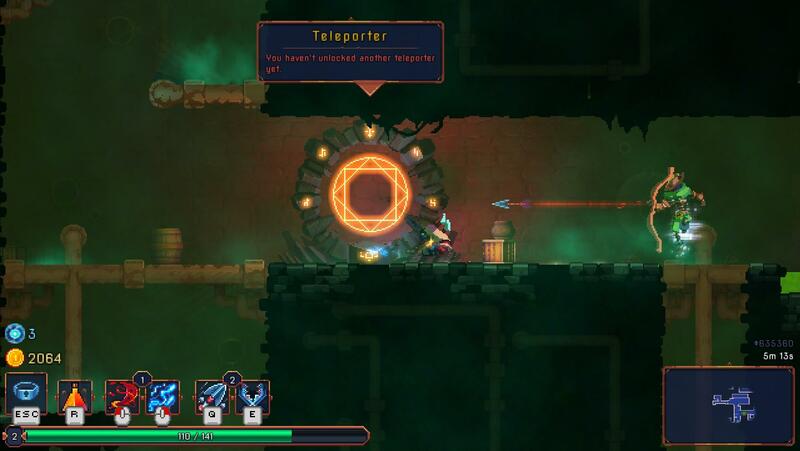 The skills in Dead Cells have to be looted and are lost on death like any other equipment item. But while easily lost the skills are extremely good at keeping you alive. The Flashbang and Ice grenade provide great crowd control allowing a few free hits before the enemies can react. 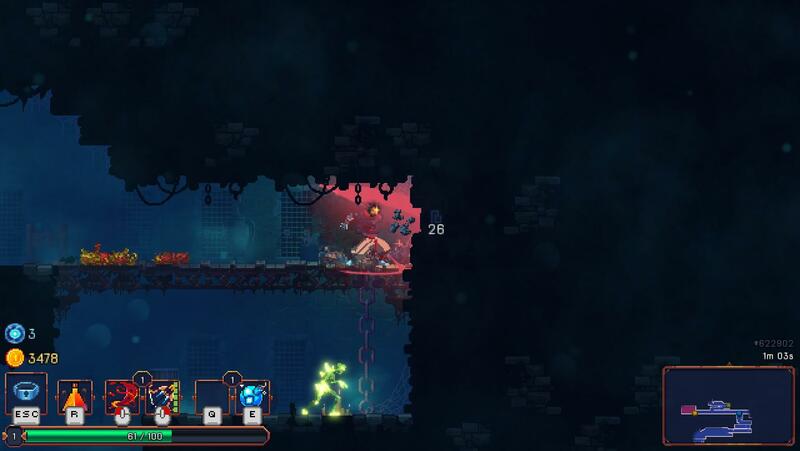 The Horizontal Turret and the Bear Trap are great for stronger enemies like bosses. And various other types of grenades are great at dealing burst damage. Use the skills you looted to destroy your enemies but make sure you replace the ones you’re sure you don’t need because there are only two skill slots available. Dead Cells’ combat is easy to get into but part of a pretty difficult and getting an advantage is important. Farming for hours and hours could get you in a good position but it’s always handy to know the gameplay tricks that you can constantly use. The best way to start a fight is by crowd controlling and several skills are great at controlling enemies. But why rely on loot when you can stun drop on your enemies? Enemies can be stunned just by dropping down on them from a good enough height (mid-air, latter or droppable platforms). This combo can be performed by pressing the down key immediately followed by the jump key. Doors can also be used to stun enemies by hitting them when the enemies are in proximity giving you enough time to land a few unopposed strikes. 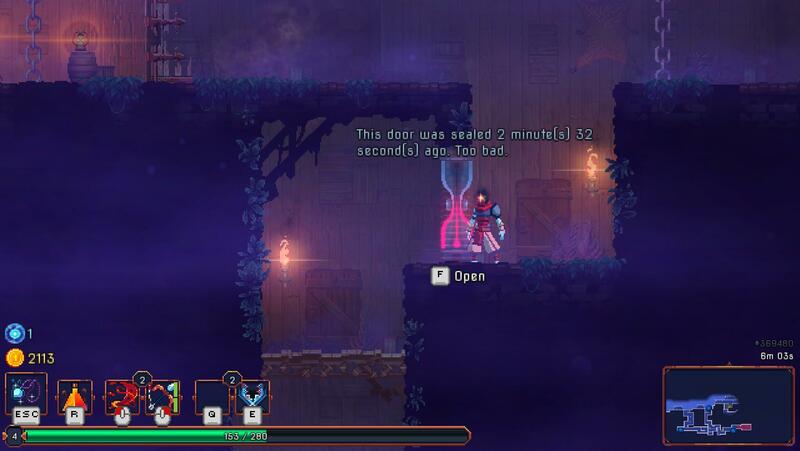 There are a lot of things set to kill you in the procedurally generated world of Dead Cells but dropping from a big height isn’t one of them. It surely will stun you for a moment or two, which is dangerous when enemies are around, but you won’t lose any health just by falling. Knowing this might ease your fear of heights but beware that dropping down a bottomless pit does cause considerable damage as a price to be respawned back on the ledge. 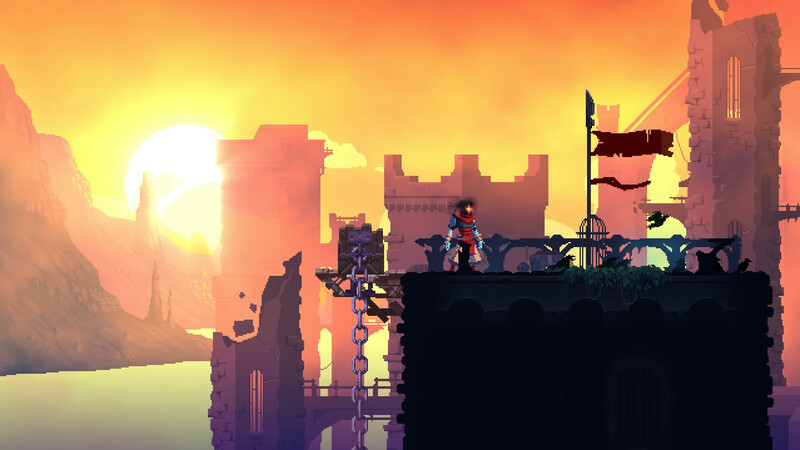 Dead Cells is a game of skill and patience, while the two could go hand in hand their compatibility isn’t assured in every situation. Being a patient player can get you a long way but there is an incentive to be fast in this game. There are time barriers that can stop you from getting new rewards or winning challenges meaning that sometimes you have to take risks for greater rewards. Let's see those speed runs! This type of games isn’t usually friendly for mouse and keyboard controls and the developers at Motion Twin warn you about this right from the main menu. But as an almost purist I found no problems playing Dead Cells with my favorite peripherals. The horizontal nature of the attacks allow for a good character control without the need of an analog stick so don’t be afraid you’ll need a controller for this game you won’t, at least not with its current mechanics.